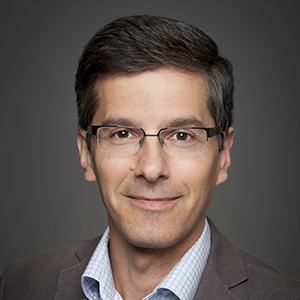 Dr. Daniel Figeys is a Professor in the Department of Biochemistry, Microbiology and Immunology and a member of the Ottawa Institute of Systems Biology. Daniel obtained a B.Sc. and a M.Sc. in chemistry from the Université de Montréal. He obtained a Ph.D. in Chemistry from the University of Alberta and did his postdoctoral studies at the University of Washington. Prior to his current position, Dr. Figeys was Senior VP of System Biology and Lead Profiling with MDS-Proteomics (2000-2004). He was responsible for all the analytical functions of MDS-Proteomics. Microbiome-host studies: In collaboration with Dr. Alain Stintzi and Dr. David Mack (CHEO), we are studying the interaction between the host and gut microbiome 1 in inflammatory bowel disease (IBD) in a pediatric cohort. We use proteomics to discover the changes in the host 2, 3, metaproteomics 4 to study the functional changes occurring in the microbiome, and cross-kingdom analysis to reveal potential relationships between the host and microbiome. MetaLab bioinformatics platform: We are developing, in collaboration with Dr. Alain Stintzi and Dr. Mathieu Lavallée-Adam, bioinformatics tools for the identification and quantitation of metaproteomes. We adopted an iterative database search strategy, termed MetaPro-IQ, which constructs a shrunken, sample-specific, non-redundant database 5. The resulting sample-specific database was used to obtain high-efficiency protein identifications in the analysis of gut microbiome samples 5. We also developed a fully automated, data processing software platform termed MetaLab, that includes new data processing approaches to speed up searches, and covers the major components of the bioinformatics and statistical pipelines for metaproteomics (imetalab.ca; online version of MetaLab)6. Microbiome assay: We are developing, in collaboration with Dr. Alain Stintzi, a new assay called RapidAIM (rapid assay of an individual’s microbiome) to study compound-microbiome interactions using individual microbiomes 7. Briefly, the RapidAIM approach consists of ex vivo growth and maintenance of microbiotas from individual participants in multi-well plates in the presence of select compounds, followed by characterization of their response over time 8, 7, 5. Circadian cycle: Many behavioral and physiological processes have daily fluctuations or circadian rhythms, which are controlled by an intrinsic timekeeping mechanism. The circadian system ensures that the timing of these processes is optimal with respect to other ongoing internal events, as well as to the external environment. In mammals, a central pacemaker that is situated in the suprachiasmatic nucleus (SCN) of the brain coordinates rhythms in peripheral tissues. We are studying, in collaboration with Dr. Mary Cheng (UofT), the circadian proteome in different tissues 9, 10, as well as the changes in the circadian proteome in normal aging and aging related diseases such as Alzheimer’s Disease. Proprotein convertases: The importance of this nine-member family of serine proteases for health is underscored by pathologies associated with dysregulated proprotein convertase subtilisin/kexin like (PCSK) activity including cancer, diabetes, obesity, arthritis, atherosclerosis and cardiovascular disease (CVD). We use in vitro and ex vivo models to study cellular biology of PCSKs, the relationships between post-translational modifications, interacting proteins and PCSK function, as well as their transcriptional regulation 11, 12. In collaboration with Dr. Paul Wiseman (McGill) we are defining PCSK and protein partner trafficking. We use PCSK knockout mice models to study PCSK roles in energy and lipid homeostasis. These studies are complemented by our genetic screening of Canadian cohorts for PCSK9 and LDLR variants, correlating these, with risk of- or protection from high cholesterol levels and CVD, and carried out with collaborators Dr. Michel Chrétien (IRCM/OHRI) and Dr. Teik Chye Ooi (TOH). Technology development: We are interested in the development of new technologies to address protein bioanalytical challenges. Currently, we are developing approaches for the study of post-translation modifications including: protein glycosylation 13, 14. methylation 15 and acetylation. These technologies are then used with our ongoing applied projects and in collaborations. 1 Starr, A. E. et al. Proteomic and Metaproteomic Approaches to Understand Host-Microbe Interactions. Analytical chemistry, doi:10.1021/acs.analchem.7b04340 (2017). 2 Starr, A. E. et al. Proteomic analysis of ascending colon biopsies from a paediatric inflammatory bowel disease inception cohort identifies protein biomarkers that differentiate Crohn's disease from UC. Gut 66, 1573-1583, doi:10.1136/gutjnl-2015-310705 (2017). 3 Mottawea, W. et al. Altered intestinal microbiota-host mitochondria crosstalk in new onset Crohn's disease. Nat Commun 7, 13419, doi:10.1038/ncomms13419 (2016). 4 Zhang, X. et al. Deep Metaproteomics Approach for the Study of Human Microbiomes. Analytical chemistry 89, 9407-9415, doi:10.1021/acs.analchem.7b02224 (2017). 5 Zhang, X. et al. MetaPro-IQ: a universal metaproteomic approach to studying human and mouse gut microbiota. Microbiome 4, 31, doi:10.1186/s40168-016-0176-z (2016). 6 Cheng, K. et al. MetaLab: an automated pipeline for metaproteomic data analysis. Microbiome 5, 157, doi:10.1186/s40168-017-0375-2 (2017). 7 Zhang, X. et al. In Vitro Metabolic Labeling of Intestinal Microbiota for Quantitative Metaproteomics. Analytical chemistry 88, 6120-6125, doi:10.1021/acs.analchem.6b01412 (2016). 8 Li, L. et al. Evaluating in Vitro Culture Medium of Gut Microbiome with Orthogonal Experimental Design and a Metaproteomics Approach. Journal of Proteome Research, doi:10.1021/acs.jproteome.7b00461 (2017). 9 Chiang, C. K. et al. Phosphoproteome Profiling Reveals Circadian Clock Regulation of Posttranslational Modifications in the Murine Hippocampus. Front Neurol 8, 110, doi:10.3389/fneur.2017.00110 (2017). 10 Chiang, C. K. et al. The proteomic landscape of the suprachiasmatic nucleus clock reveals large-scale coordination of key biological processes. PLoS Genet 10, e1004695, doi:10.1371/journal.pgen.1004695 (2014). 11 Starr, A. E. et al. beta-Estradiol Results in a PCSK9-Dependent Increase in LDLR Levels in Human Hepatic HuH7 Cells. The FEBS journal, doi:10.1111/febs.13309 (2015). 12 Denis, N. et al. Quantitative proteomic analysis of PCSK9 gain of function in human hepatic HuH7 cells. J Proteome Res 10, 2011-2026, doi:10.1021/pr2000072 (2011). 13 Chen, R., Zou, H. & Figeys, D. Detergent-Assisted Glycoprotein Capture: A Versatile Tool for In-Depth N-Glycoproteome Analysis. J Proteome Res 15, 2080-2086, doi:10.1021/acs.jproteome.6b00056 (2016). 14 Chen, R., Cheng, K., Ning, Z. & Figeys, D. N-Glycopeptide Reduction with Exoglycosidases Enables Accurate Characterization of Site-Specific N-Glycosylation. Analytical chemistry 88, 11837-11843, doi:10.1021/acs.analchem.6b03531 (2016). 15 Ning, Z. et al. A charge-suppressing strategy for probing protein methylation. Chem Commun (Camb) 52, 5474-5477, doi:10.1039/c6cc00814c (2016). Please note for any questions relating to Biochemistry or Microbiology graduate studies admissions, registration (local or international, course prerequisites, finding a thesis supervisor, please contact gradmed@uottawa.ca or call 613-562-5215, or 1-877-868-8292 extension 5215.